Fremstillede cellulose-baserede tekstil-fibre dækker over en række forskellige produkter; For de mere kendte er Lyocell, Viskose, Modal, Cupro, Tencel, Acetat og Triacetat (rayon er det amerikansk ord for viskose) og de adskiller sig fra hinanden ved at blive fremstillet ved hjælp af forskellige kemiske metoder. Viskose var blandt de første cellulose-baserede regenererede tekstilfibre, og produktion var oprindelig særdeles forurenende, og er det nok stadig i ret stort omfang. Dog, i miljømæssig bæredygtighedssammenhæng er det europæiske firma Lenzing ret interessant. De producerer forskellige cellulose-fibrer, og er kendte for at producere den cellulose-baserede tekstil-fiber Tencel vha den såkaldte Lyocell metode. Men, de producerer også viskose på en mere miljømæssig forsvarlig måde end de øvrige viskose-producenter. s. 51: Lenzing har “certified all fiber and pulp production sites, without exception, in accordance with the system certifications ISO 9001, ISO 14001 and OHSAS 18001“. 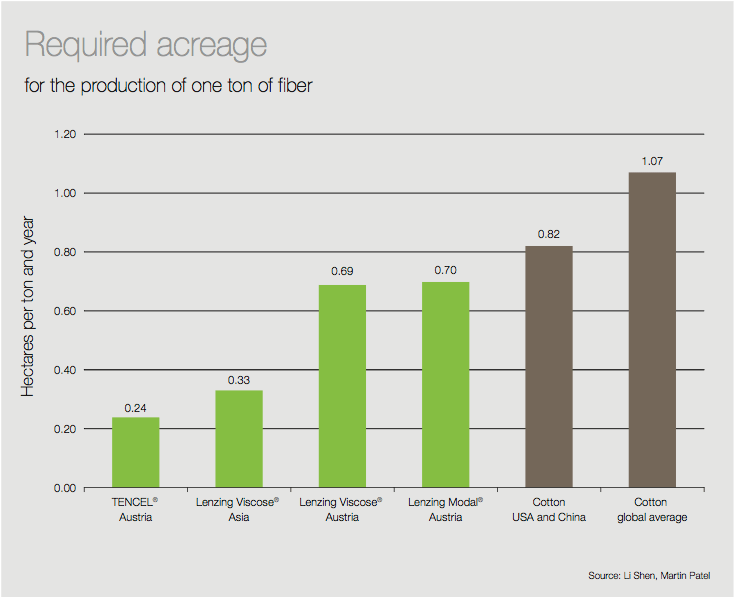 s. 53: Four of the six fiber production facilities of the Lenzing Group presently have EU Ecolabel certification: Lenzing and Heiligen- kreuz in Austria, Mobile in Alabama, USA, and Nanjing in China. Lenzing is striving to have all production sites meet the criteria in the medium term. Purwakarta, Indonesia, and Grimsby, United Kingdom, are the two production locations not currently certified. There is only one criterion not yet met at Purwakarta: sulfur emissions released to the air. Work is already underway to up- grade the technical facilities to reduce these emissions. Further actions will be needed to achieve the challenging limit. The Grimsby facility, too, has just one criterion left to satisfy, namely the chemical oxygen demand in the wastewater. However, the wastewater situation complies with local legal regulations and also the EU Water Framework Directive. Lenzing har selv (!) 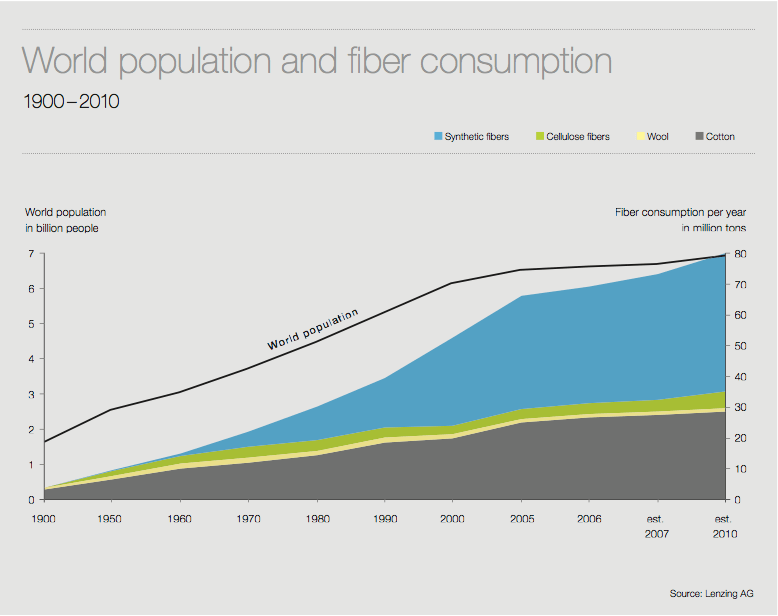 fået gennemført undersøgelse af “Environmental load”, resultatet fremgår af denne figur. Side 48 i deres sustainability report fra 2008. 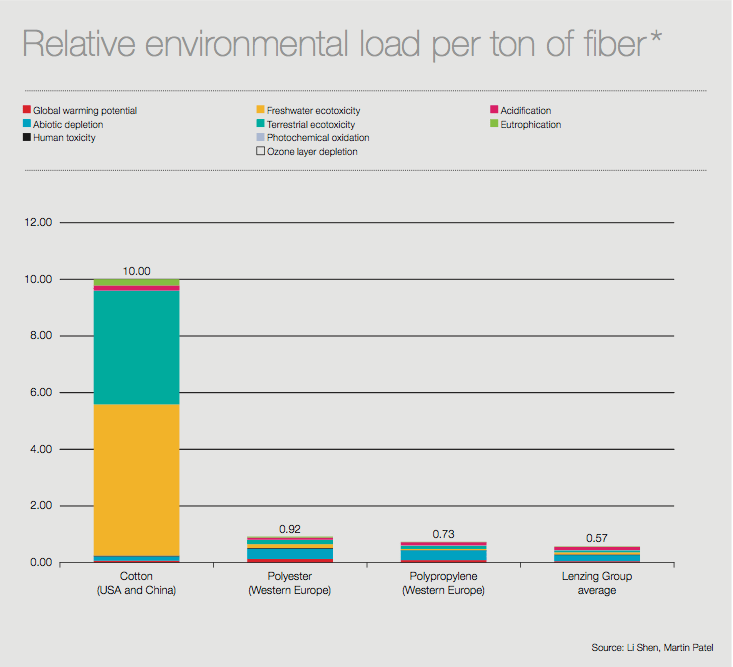 The overall picture clearly shows the advantage of Lenzing cellulose fibers. 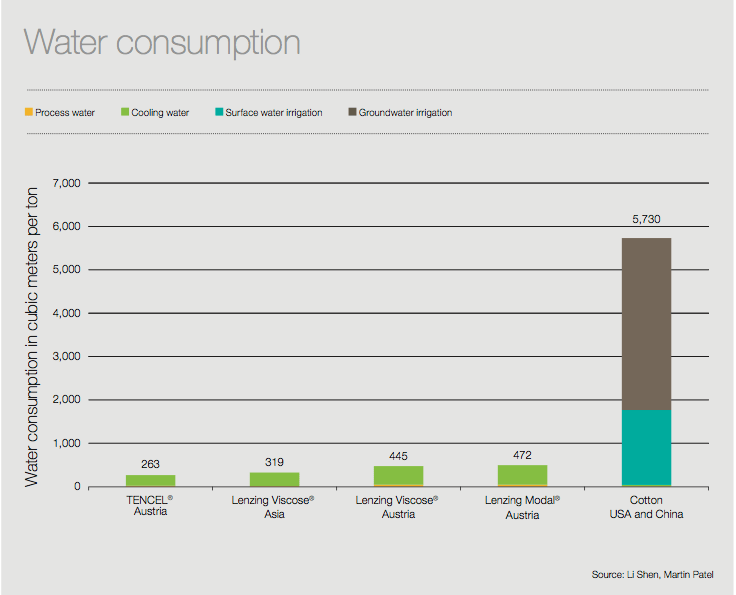 Detailed analysis shows viscose and modal fibers produced at the Lenzing site to be particularly sustainable. This is the result of synergy between the integrated production of pulp, energy and fibers, which proves and represents the best available technology of the fiber industry. Production conditions of viscose production in Asia are less favorable in terms of abiotic depletion and potential global warming but still significantly better than those of cotton. The good results for the TENCEL® fiber are due to its ecologically sound lyocell production process, which has received several awards. Endelig, vandforbruget, samme historie (selvfølgelig): Viskose, både asiatisk produceret og østrigsk produceret, kræver markant mindre vand (hhv. 319 m3 og 445 m3) end bomuld (5730m3 vand pr ton fiber produceret). side 51 i sustainability rapport for 2008. Lenzing Nanjing is one of the most tech- nologically advanced viscose fiber produc- tion plants in Asia. Closed chemical cycles, a waste gas purification plant (TOPSOE) unique in the Chinese viscose industry and efficient energy management make the fa- cility a best-practice plant in China. Construction of stage two of the waste- water purification plant. Start-up of a Supersorbon plant for the re- covery of CS2 from fiber production waste gas. The plant is the first of its kind in Asia. Optimization of energy supply: heavy fuel oil was fully replaced by natural gas. Pulp is steeped in a sodium hydroxide solution and converted to alkali cellulose. The addition of carbon disulfide causes cellulose xanthate to form. The xanthate is dissolved in diluted sodium hydroxide solution, filtered, deaerated, ripened and metered through spinnerets into a sulfate regenerating bath. After that, the fibers are stretched, cut, desulfurized and bleached with a sodium hypochlorite solution or a hydrogen peroxide solution. The fibers are repeatedly washed between the individual subsequent treatment steps. After the last wash, finishing agents are applied to ensure the running and gliding properties for further processing. As a final step, the fibers are dried and pressed into bales. Zinc sulfate is removed or recovered from the wastewater (At site in Lenzing only). Sulfur-containing gases generated during spinning are collected and recovered once again in the purest form as the chemicals carbon disulfide and sulfuric acid. The co-product sodium sulfate is produced from the input chemicals sulfuric acid and sodium hydroxide solution. For at opsummere, så er min oplevelse at Viskose KAN produceres forholdsvis bæredygtigt, når Lenzing gør det (Tencel er selvfølgelig bedre), men hovedparten af verdens produktion af viskose er (formentlig) ret miljømæssigt belastende… Så, måske holder Viskose ikke i forhold til miljømæssig bæredygtighed, men der er en stor global produktion, som der kan forbedres på.